Sergio Aguero took centre stage with a finishing masterclass to take his tally in Manchester City's last seven home games to 14 goals. 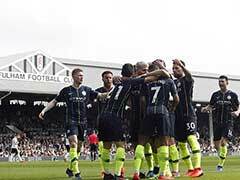 Pep Guardiola hailed Sergio Aguero as an "authentic legend" of Manchester City after his four second-half goals continued their emphatic march towards the Premier League title with a 5-1 thrashing of Leicester City. Raheem Sterling had given City an early lead on Saturday but Leicester went into the break on level terms thanks to Jamie Vardy's equaliser. However, Aguero took centre stage with a finishing masterclass to take his tally in City's last seven home games to 14 goals as Guardiola's side moved 16 points clear at the top of the table. "An authentic legend of this club," said Guardiola of his prolific striker. "In the second half he scored four goals. Sergio is like this, he has a special talent in the box. He's clinical... especially the third one and fourth one are amazing." "He came and spoke to the lads in the dressing room. He put it to bed and we move on," said Leicester boss Claude Puel. The Algeria international had seen a proposed deadline day transfer to the Etihad Stadium collapse after the Foxes rejected City's offer. But it didn't take long for the home side to show the abundance of talent they have going forward despite missing out on Mahrez and coping with a series of injuries to the likes of Leroy Sane and Gabriel Jesus. 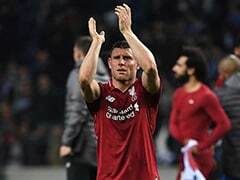 However, shortly before the half-hour mark City were rocked when Vardy showed great pace to get beyond City's record signing Aymeric Laporte and his shot deflected into the bottom corner to complete the striker's haul of scoring against all of the Premier League's top six this season. City threatened an immediate response as Kasper Schmeichel was forced to save at his near post from a fierce angled shot from De Bruyne while Aleksandar Dragovic's timely sliding block denied Sterling. Leicester's resistence didn't last after the break as Aguero scored twice in five minutes to effectively end the game as a contest. Moments later a weak clearance from Schmeichel was ruthlessly punished as a clinical City move culminated in De Bruyne's third assist and a fierce angled shot from Aguero which the Leicester goalkeeper got a hand to but could not prevent going in. "They're an excellent team, not many have got close to them this season, but the timing of their first and second goals were really tough for us," added Puel. "We felt we could have stopped a couple of their goals today, because they were our fault." With just under a third of the game left Mahrez came on for Fousseni Diabate, to cheers from both sets of supporters. The day belonged to Aguero, though, and he rounded off the game with two superb strikes. "Maybe the last one," said Aguero on which of the strikes was his favourite. "Because it's a long time since I scored from outside the box."